NASA is launching its most advanced probe yet to study the planet Jupiter on Friday (Aug. 5). 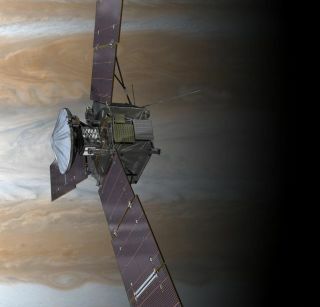 But the new mission, called Juno, is standing on the shoulders of giants, its managers said — specifically the eight robotic spacecraft that visited the gas giant planet previously. Launched in September 1977, Voyager 1 flew by Jupiter in March 1979, taking more than 18,000 images of the gas giant and its satellites. The vehicle made its closest approach at a distance of about 217,000 miles (349,000 kilometers) of the planet's center. Among Voyager's discoveries was the presence of volcanic activity on Jupiter's moon Io. Galileo was the first mission sent to orbit Jupiter. The vehicle launched in October 1989 and arrived in orbit around the planet in December 1995. While in orbit, Galileo dropped a probe down to the surface that measured the temperature, wind speeds and pressure of Jupiter's atmosphere as it descended. Galileo's mission was extended to study Jupiter's moons Io, Europa, Ganymede, and Callisto, and it revealed a trove of secrets about these satellites, including the presence of a salty ocean under Europa's surface and an iron core and magnetic field on Ganymede. Galileo studied Jupiter until 2003, when it was decommissioned and sent on a suicide mission to crash into Jupiter's surface in order to avoid contaminating any of the Jovian moons with bacteria from Earth. This "family portrait," a composite of the Jovian system, includes the edge of Jupiter with its Great Red Spot, and Jupiter's four largest moons, known as the Galilean satellites. From top to bottom, the moons shown are Io, Europa, Ganymede and Callisto. This amazing color portrait of Jupiter’s “Little Red Spot” (LRS) combines high-resolution images from the New Horizons Long Range Reconnaissance Imager (LORRI), taken at 03:12 UT on February 27, 2007, with color images taken nearly simultaneously by the Wide Field Planetary Camera 2 (WFPC2) on the Hubble Space Telescope. The Little Red Spot is the second largest storm on Jupiter, roughly 70% the size of the Earth, and it started turning red in late-2005. The clouds in the Little Red Spot rotate counterclockwise, or in the anticyclonic direction, because it is a high-pressure region. In that sense, the Little Red Spot is the opposite of a hurricane on Earth, which is a low-pressure region – and, of course, the Little Red Spot is far larger than any hurricane on Earth. The mission will build on all those that have gone before, hopefully helping scientists fill in the gaps in their understanding of Jupiter's formation and evolution, as well as the history of the solar system in general. The spacecraft is outfitted with instruments to study in detail the gas giant's atmosphere, magnetosphere and gravitational field. Scientists will investigate the auroras that rage on Jupiter's poles, and construct a 3-D map of the planet's full environment.